Are you in volatile domain business and want to learn the art and techniques of selling a domain successfully and profitably? Then this article is certainly going to help you understand how to sell your domain name at the highest price. Domain business is just as similar real estate business and as domain flipper, it is critical to understand how the art of selling a domain name at the highest possible price. There are some domains that have made millions of dollar. Here is the list of domain names that have sold as expensive ones. And the fact is – it is also true that people have paid so much to acquire just these domain names. So imagine how much you can earn if you were the owner of one of these domain names. What are the possibilities that can happen if you have registered such a domain in your name before it was sold? As simple as it can get you could have become a millionaire. But don’t want to understand how these simple domains sold for millions of dollars? The fact is that these domain names will look pretty simple to your eyes. But the people who purchased the domains entirely saw something unique or they were made to see something unique. This is what is called the art of selling the domain names at the highest price. What you need to understand is you need to learn the art of showing highest possible prices for your domain names. A domain name is just about the name and it has a layer of significance for that. As common as it gets for people, the first thing they would remember about the site is the domain name. So, every online business starts with a domain name. It doesn’t matter whether you have a million dollar business or small-scale business, you have to start with a domain. People hope to have certain kind of names for their businesses. The bonus here is if they find exactly what they want or the domain name meets their expectations, then they wouldn’t mind paying even hundreds of dollars for the domain names. How Would You Sell Your Domain Name At the Highest Possible Price? Brandable domain names are sold in large numbers than any other types of domain names. These kinds of domains that sound like a great brand can easily be associated with any kind of businesses. Large-scale businesses are known to invest thousand dollars to build your business. So the result is businesses would not mind paying you so much money to acquire the domain name from you. Can’t you believe what is said? Look at yourself at brandbucket and see how much most of their domain names cost just because of their brandability. Brandbucket is one of the most visited online marketplaces for creative and brandable business names. And undoubtedly most of their domain names are sold for thousands of dollars and yes people do purchase these domains. So if you are in the buying and selling domain business, what are you waiting for? Purchasing brandable domain name puts you ahead in the marketplace and ensures your success. It is crucial to have a custom logo while you are selling a brandable domain name. To make selling to your advantage, you can invest by hiring a logo designer to make creative logos for your domain and make your domain look more appealing for the buyers. Creating a custom made logo need not cost you a lot. The reason we insist on creating a logo for your domain is it precipitates the chance of selling your domain at a higher price. Although you will find it difficult to hire high-quality logo designers, most of the times you find people to do it at a mere amount of $5 or $10. Best places to find high-quality designers is at Fiverr. However, there are many online platforms to find people according to your requirements and this shouldn’t be a problem for you. You should understand by creating a logo, we do not guarantee you that your domain will be sold but only increase your chances exponentially. Although there are numerous places online to sell your domain name, it is recommended and essential to stick to the best ones always. The best-recommended site is Flippa. Once you have listed your domain name in Flippa, you may buy some targeted traffic to advertise your domain listing page. You can also read the article Where should you Start Your Domain Flipping Business? 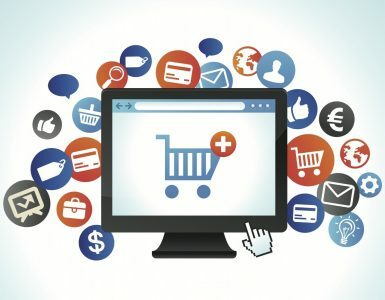 The article describes the best possible platforms to sell a domain name and hopefully, you make this to your advantage. You also go through work website DN Finder where you can get great value and highest price domain names and also sell your branded domain names with us. You also consider having a great write up or description of your domain that focuses on the value of the domain and why would anyone want to buy your domain? Write a description that will answers that an interested buyer might have in mind. Be realistic and don’t make false promises. If you want to look at some examples, go unto Flippa and read up descriptions of recently sold domains. This will certainly help you come up with a draft of your domain write up. 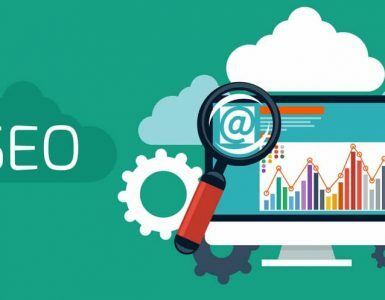 From the above, you will be in the notion that many domains are sold for thousands of dollars, but do not be unrealistic to believe that any similar sounding domain names can be sold for such prices. At times your domains will not even be sold if the asking price is in the higher range. However, if your domain has high value and has an impressive name, it might hit the big figures and the domain would deserve to be sold at higher price. 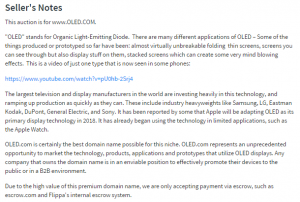 Example – OLED.com was sold for $56100. It had a whopping 178 bidders. All these people were just bidding to acquire this domain name and was ready to pay right away. At last, it was sold at $56100. So now let’s face the reality. How much would you have earned if you had registered this domain at $10? However you cannot give a definite answer because the answer to this question depends on how well you choose your domains and how effectively you promote it to the right people. No wonder the listing was highly successful with such great description. With this example, it is clear that why many people are ready to pay to get the right domain name. This makes the domain flipping a highly interesting and profitable business. Though you may not be able to make thousands of dollars while you sell your domains, you can still make high profits by selling the domain names. It is never uncommon for a $10 domain name to be sold at $100 or more. You can surely turn this third digit figure into a four-digit figure quite easily with the right methods and right guidance. Nonetheless, success cannot be guaranteed. From the above information, I hope you have realized the potential of domain flipping business because this business can make anyone into a millionaire. 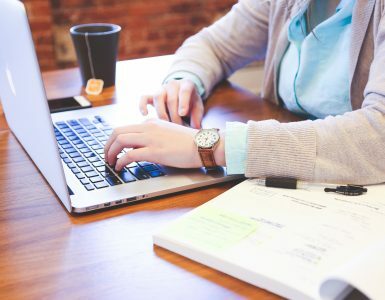 Even though selling a domain name at the highest possible price is an art; these three reasons certainly influence a successful sale at the most. There are many more reasons that might help you sell your domain at the highest price, but we feel these are the three important reasons amongst others. With experience, you will surely master the art and techniques. But if you are a beginner, you should definitely focus on these factors. So to wrap up, you need to buy the right domain name which is brandable, then create a high-quality logo for the domain and make people see its highest value at the best platform. This is all that you have to focus on.